One of the largest wholesale online distributors of LED signs AffordableLED.com launches 31 new designs of programmable LED signs for store owners and retailers. These LED signs can easily be customized using a remote keyboard. In the world of business, it is indeed a fast and furious race to the top. With millions of other contenders trying to outdo each other, one has to definitely stand out and be noticed in order to survive in the dog-eat-dog world of business. One surefire way of rising above the rest is to have creative LED signs that would make people stop, look and absorb the information. As times are constantly changing, more and more businesses are starting to use LED signs because of their various advantages to neon signs. LED signs flash, move, scroll, and animate in many ways making it more exciting to see and a lot more interesting to look at. As it is a basic human trait to pause and check out any moving video or text, LED signs will not only get noticed more, it will also convey any company's message more effectively. AffordableLED.com, the largest online wholesale distributor of LED signs, has now added more designs to its already vast selection of LED signs. Just recently, the company has added 31 new designs of programmable LED business signs. These LED signs are specially designed for retailers and business owners alike. It is very cost-effective as messages can be instantly changed or revised via a remote keyboard making it really easy and convenient. What's more, these LED signs use 70% less energy and only takes less than an hour to put up. They are lightweight, easy to install, and safe to touch and operate. Combined with light, color, and motion, these programmable LED signs provide an effective window of opportunity that can reach out to more customers any time of the day. While the main reason for programmable LED signs is to attract more foot traffic, they can also offer more savings for the company in the long run. With all the advantages of LED signs being offered now, investing in one can possibly be a very wise move. 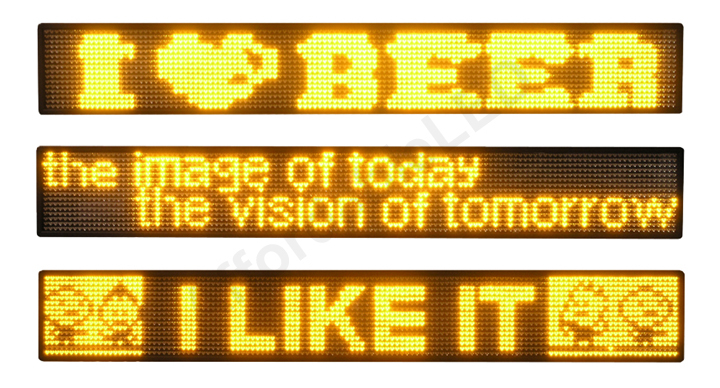 Programmable LED SignsChoose from a variety of programmable LED signs that will suit your needs! Programmable LED SignsChoose from a variety of programmable LED signs that will suit your needs! Programmable LED SignsChoose from a variety of programmable LED signs that will suit your needs! Business LED SignsChoose from a variety of business LED signs that will suit your needs! Business LED SignsChoose from a variety of business LED signs that will suit your needs!